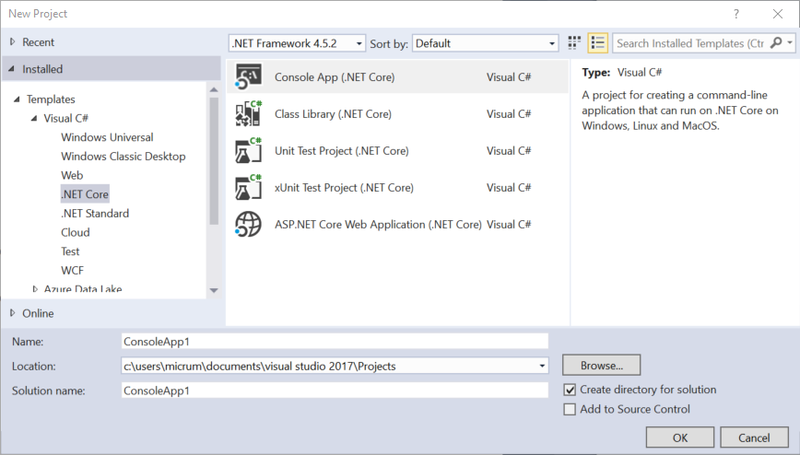 In this post, we’re going to look at Visual Studio 2017 and the updated CLI tools and what that means for .NET Core. If you haven’t downloaded Visual Studio 2017 yet, then you should grab it! 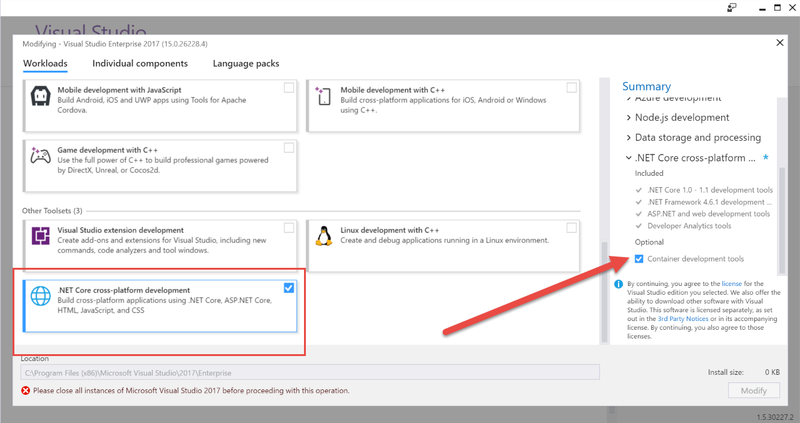 After downloading it, make sure the .NET Core cross-platform development box is checked. You will find it under “Other Toolsets” as shown below. You’ll also want to make sure the Container development tools is checked. Once it is installed, you can open Visual Studio 2017 and goto File->New Project and select .NET Core as shown below to enjoy the new templates. You may notice that now you will see the Unit Test and xUnit Test Project Templates. You may notice a few other differences once you have loaded your project, but they are minor. 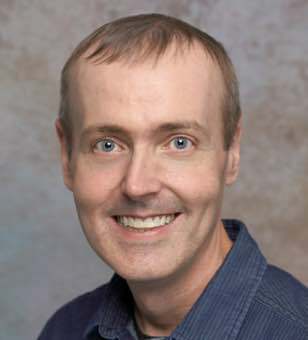 If you’ve read my previous post then you would know that I talked about project.json going away and the move towards MSBuild. Well the time has come that it is now gone. Don’t worry you can still quickly modify your Target Framework, etc. You should probably begin by taking a look at the project properties. You will notice that the Target Framework has .NETCoreApp1.0 and 1.1 to select from. You can also open the .csproj proj directly within Visual Studio 2017. As you can see, it only contains a few lines for the Console application. Tip: If you also have a project created with an older version of .NET Core, then go ahead and open it inside of Visual Studio 2017 and it will prompt you to upgrade. That is right! We are now at 1.0. We can now run dotnet new console -f netcoreapp1.0 command to specify a .NET Core Console app that uses the 1.0 Framework. We can also use dotnet new console -f netcoreapp1.1 for a .NET Core 1.1 app. Simply type dotnet new sln and you can create a Solution file for those instances where you have multiple projects. You can think of this as a replacement to your project.json files. It looks like .NET Core is getting better and better! As always, thanks for reading and smash one of those share buttons to give this post some love if you found it helpful. Also, feel free to leave a comment below or follow me on twitter for daily links and tips.